As summer winds down so does the garden. Now all that's really left to do is battle the occasional pest and harvest, harvest, harvest! If you're like me you have fresh fruit and veggies absolutely everywhere! Preserving food is kinda my thing so I did a lot of canning and freezing this year. I mean A LOT! I wouldn't want all that lovely garden produce to go to waste after all. Just when I was at my wit's end for places to put more canned jellies, sauces and pickles...I remembered the dehydrator! I've had this dehydrator for a few years but haven't used it much for food. I use it constantly for herbs and flowers but food? Nope. I have like 3 things I make in it. Which is really silly because dehydrated food takes up much less space to store it then preserving food using any other method! 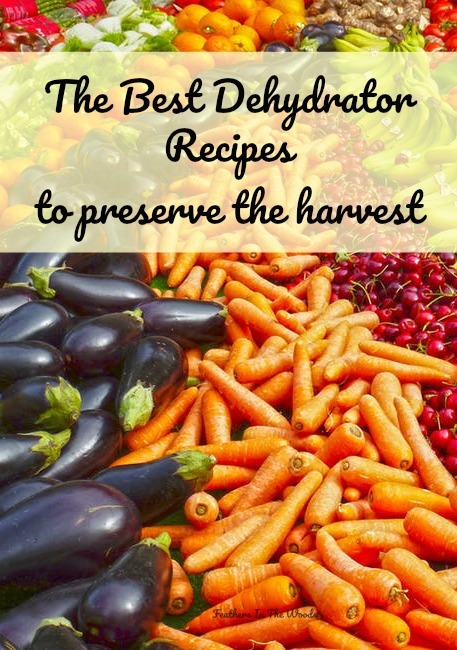 I only have a few dehydrator recipes myself but luckily, I know the right people! So I called in the big guns and asked my favorite homestead bloggers what their best dehydrator recipes were. 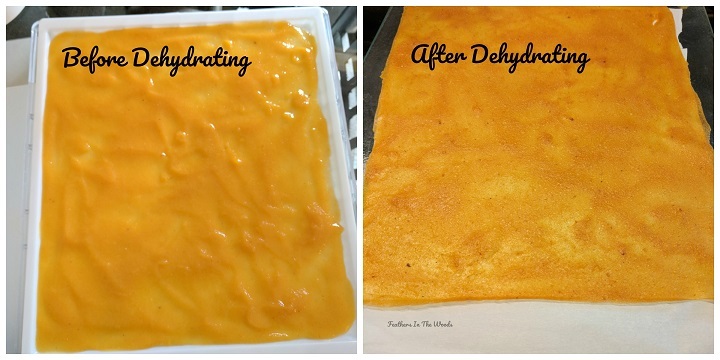 While I was waiting, I grabbed some peaches and whipped up a batch of homemade fruit roll ups in the dehydrator. Homemade fruit leather is super simple to make because it can have as few as 1 item on the ingredient list! Today I used peaches because that's what is in season right now. You also may need a sweetener. I like to use honey. I only used 2 peaches this time because I only wanted to make 1 tray. Since there are so few ingredients you can make as little or as much as you want. Plus I only have 1 sheet tray for my dehydrator so until I order more, I just make small batches. Peel, core and chop peaches. Puree in blender. 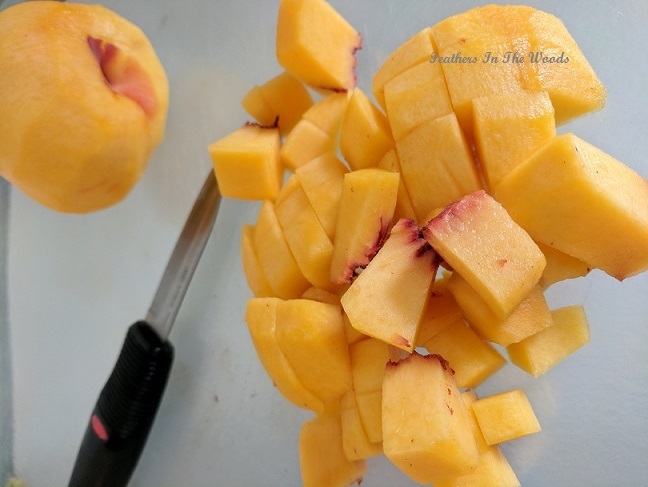 If peaches are under ripe and refuse to puree (they will still have large chunks) transfer to a microwave safe bowl and heat at 30 second intervals till hot. Don't let them boil! Pour back into blender and puree. Honey to taste. Most times it's sweet enough without adding anything to it, other times the fruit just needs a little drizzle of honey, especially if it's not real ripe. I use organic honey. Pour on dehydrator sheet and spread thin and evenly. Place trays in dehydrator at 131 for about 6 hours. I have the Ivation Dehydrator which I love, but it only has so many settings. If you have something like the Excalibur it has a fruit setting which is around 135 so use that. If your dehydrator only has low, medium & high then use the medium setting. Fruit leather takes about 4-6 hours to dehydrate. This can depend on your climate or even the days weather! It's done when the top looks completely dry and there are no soft spots when you press on it. 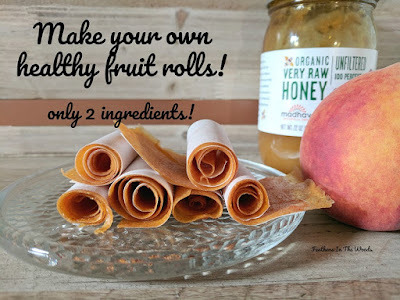 Peel fruit leather off tray and place on parchment paper. Cut into strips and roll up. That's it! Now here are those dehydrating recipes I was telling you about! Dried Pineapple Zucchini from The Free Range Life. Doesn't this just sound amazing? 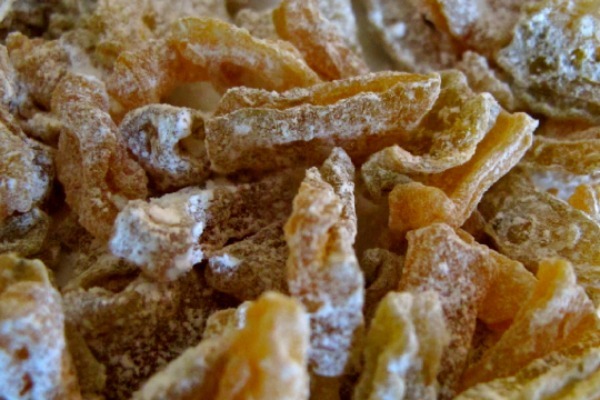 It's like candied zucchini! Plus it's an awesome way to use up all that zucchini you grew. 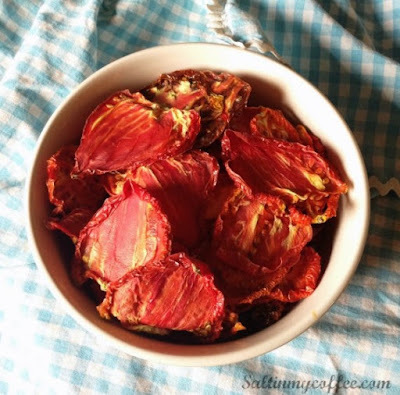 How to Make Sun-Dried Tomatoes in a Dehydrator from Salt In My Coffee. I love sundried tomatoes, but they are so expensive in my local market. Now I can make my own! 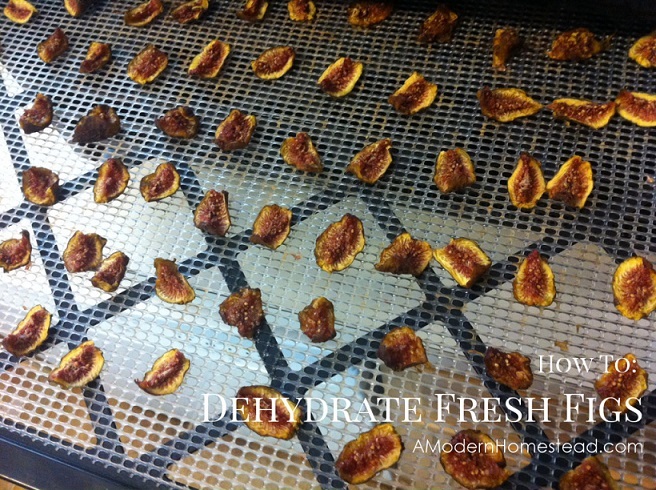 How To Dehydrate Fresh Figs from A Modern Homestead. I was just saying how figs should be ready soon and this popped up. I can't wait to make these! 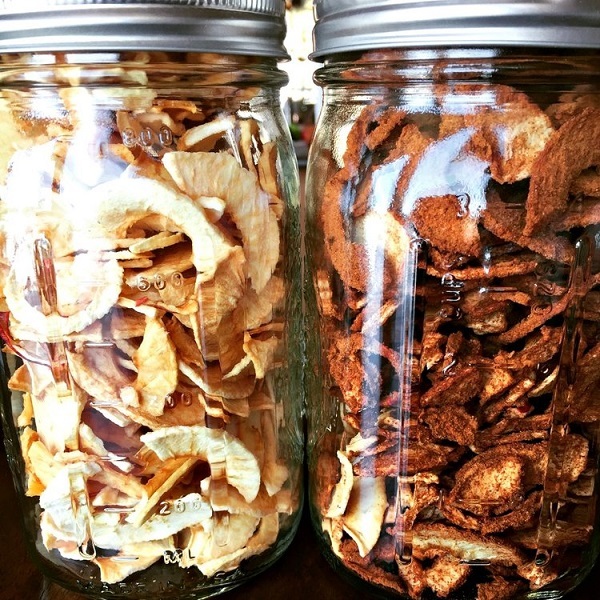 Dehydrated Apples -- Plain and Cinnamon! from Healing Harvest Homestead. These sound amazing and my son already told me he wants the cinnamon apples! Make sure you check out her 3 Ways to Preserve Peppers while you're over there! Homemade Instant Rice from Back To Our Roots. Did you know that it's possible to make your own instant rice? I was so surprised, but it's super easy and so convenient to have on hand! If you want to try your hand at dehydrating but don't have a dehydrator just yet, you can use your oven! 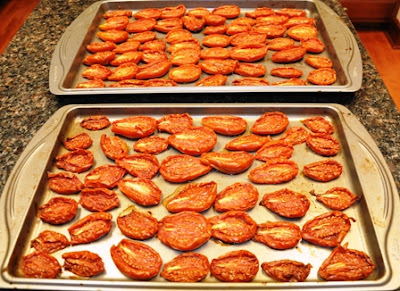 Check out these Homemade Sun Dried Tomatoes (Oven Dried Really) from Better Hens and Gardens. These look amazing and they're so much easier then I thought! 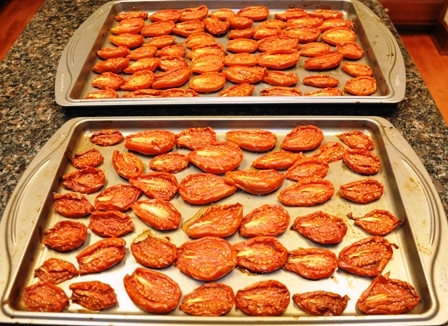 I used to have a gas oven with a pilot light and it worked great for dehydrating! Unfortunately we no longer live where gas is an option so I can't use the oven. So disappointing! What a great way to preserve the taste of summer! Great post! I love my dehydrator especially when I am tired of canning! Thanks for sharing your post on the Homestead Hop, as one of the co-hosts I will be featuring your post this week! Look forward to what you'll be sharing this week! Thank you for these recipes and links! I love dehydrating foods and my hubby and I will be building our own dehydrator soon from plans I got at Mother Earth News magazine. I can't wait to see how this solar powered dehydrator will do, because we live off grid now and an electric dehydrator just won't do. I have been dehydrating in my Sun Oven, but that is really made for cooking food, not dehydrating, and some foods don't dehydrate well in the Sun Oven. Have a great day! BTW - found you on the Homestead Blog Hop. I love harvest time, and the dehydrator is a great investment. Thank you for sharing this with us on the Homestead Blog Hop, Your post has been chosen as one of the featured links this week. Congratulations! I don't have a dehydrator but I do dry some fruits and make candies out of especially orange peels. I love them. Thanks for sharing all these different recipes and ways to dehydrate. Congratulations on being featured on Homestead blog hop. Sharing on twitter & pinning.